One of my favorite Memorial Day or Fourth of July Desserts involves natures colors. 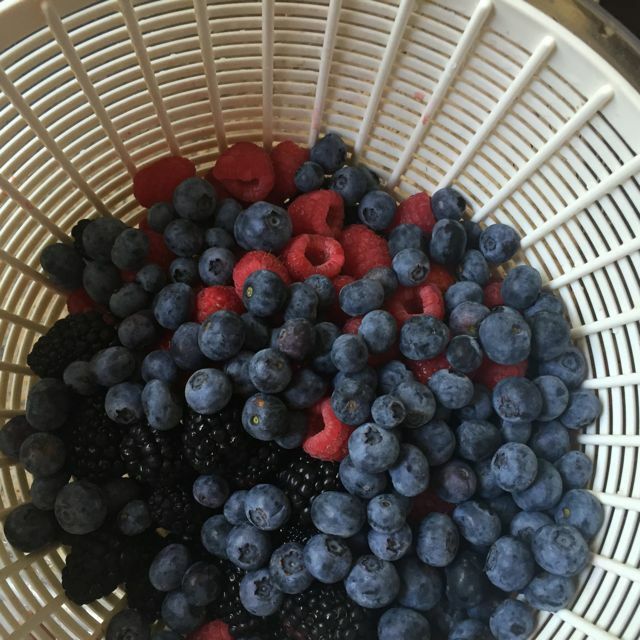 What I am referring to are the wonderful blue and red berries that are so prolific this time of year. After we recently went strawberry picking I decided to make a dessert I had not attempted since I was single. Why you might ask? I am not sure really. 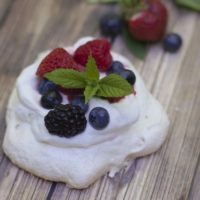 Pavlovas are super easy to make, they last indefinitely, so a great make ahead dessert and are can be filled with whipped cream and berries for a sweet but healthier dessert. These desserts look like something you would find at a nice bakery or on a dessert menu at an expensive restaurant. Let me tell you friends, you can easily make these desserts and your guests will be quite impressed. 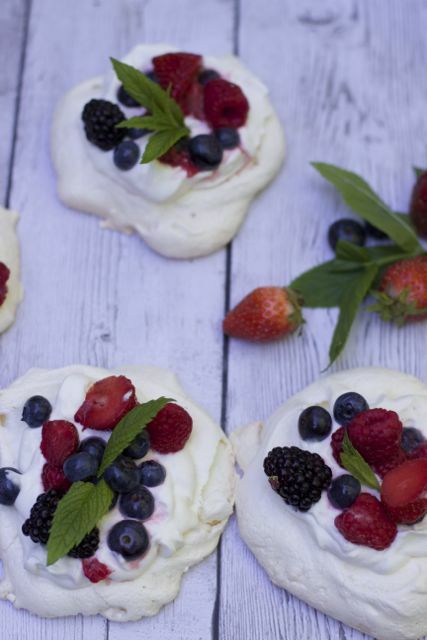 If you have ever made meringues you can make these wonderful red white and blue desserts. Individual Pavlova with fresh berries. With just a few ingredients you can make the meringue in just minutes. The longest part of this recipe is the cooking time. But if you plan ahead you can easily make these several days ahead of time. Just wrap them up properly and they will stay crisp. You can even reheat them to retain their crispness. 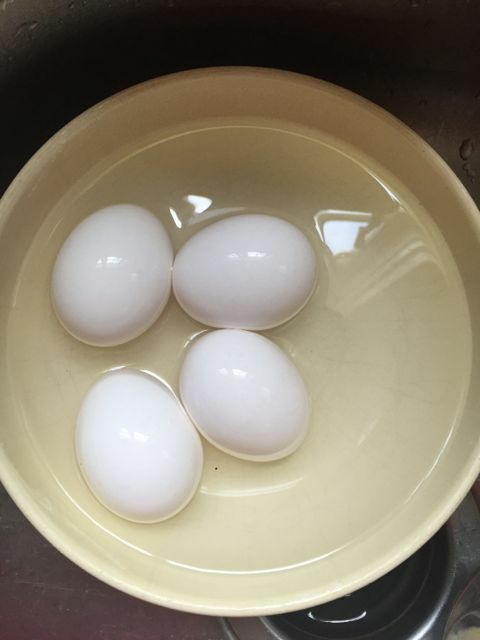 If you did not plan ahead like me, to get your eggs to room temperature quickly, just put them in a bowl of warm water and allow them to sit for a few minutes. They will reach room temperature quickly. Now it is time for your Mixer to do all the work. You are not going to want to whip these by hand, at least I don’t want to. 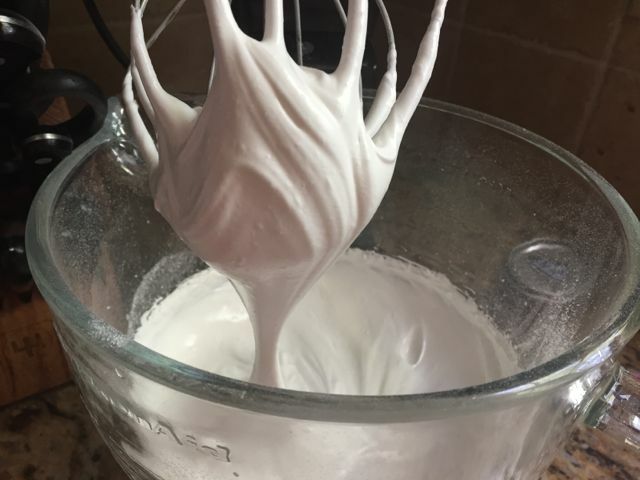 I am sure Julia Child did but this is 2016 and you if you have a mixer with a beater, like my all time favorite Kitchen-aid, you can sit back and just watch the egg white turn into this perfect meringue. 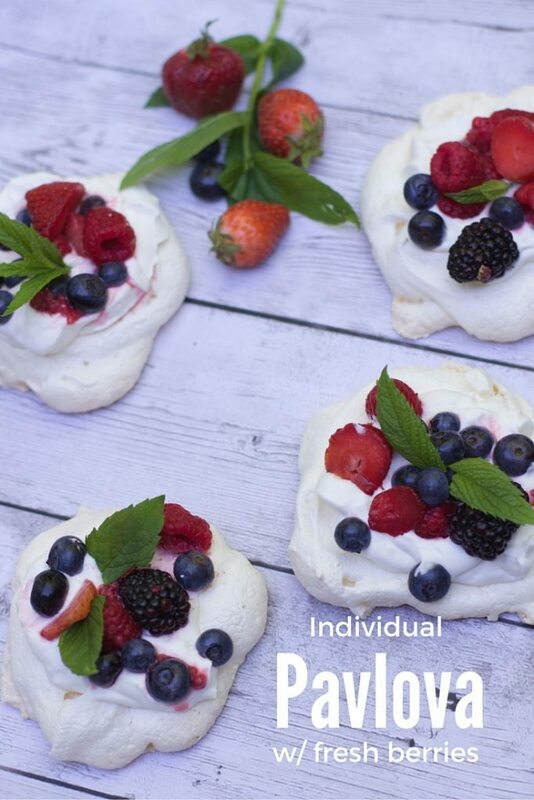 Now it is your choice you can make individual pavlovas or one large one. 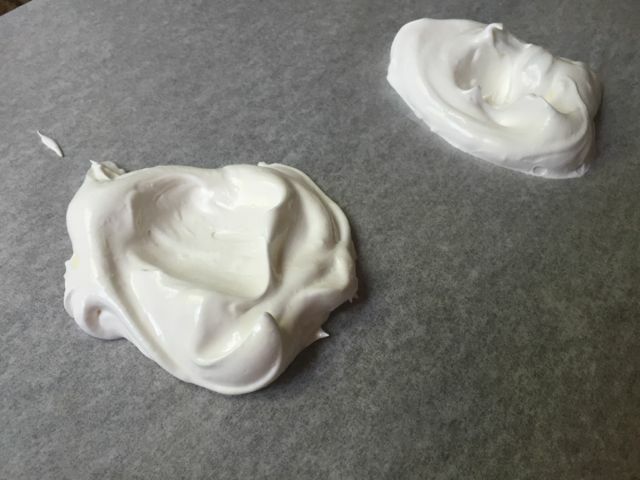 To make bakery perfect ones, you can add the meringue into a piping bag or just add globs onto parchment paper like I did and use a spoon to create a little indent for the whipped cream. While the meringue is baking and cooling in the oven, get your fruits washed and add a little sugar to get the juices moving. Next make your whipped cream and plop some in the middle of your lovely pavlovas. Top with your berry mixture. Really you can use any fruit topping you like. These crisp, but sweet desserts are sure to be a crowd pleaser. Don’t you just love the red white and blue colors for Memorial day picnic. You can pack everything separately and transport them to your destination. This dessert recipe, filled with red white and blue, will be my go to summer dessert. Pre heat oven to Preheat the oven to 225 degrees F.
Place the egg whites and salt in the bowl of an electric mixer fitted with a whisk attachment. Beat the egg whites,vanilla and cream of tartar on high speed until firm, about 1 minute. With the mixer still on high, slowly add the sugar, one tablespoon at a time, and beat until it makes firm, shiny peaks, about 2 minutes.
. Pile the meringue into small blobs the parchment paper and smooth it within the circle, making a rough disk. Bake for 1 1/2 hours. Turn off the oven, keep the door closed, and allow the meringue to cool completely in the oven, about 1 hour. It will be crisp on the outside and soft on the inside. 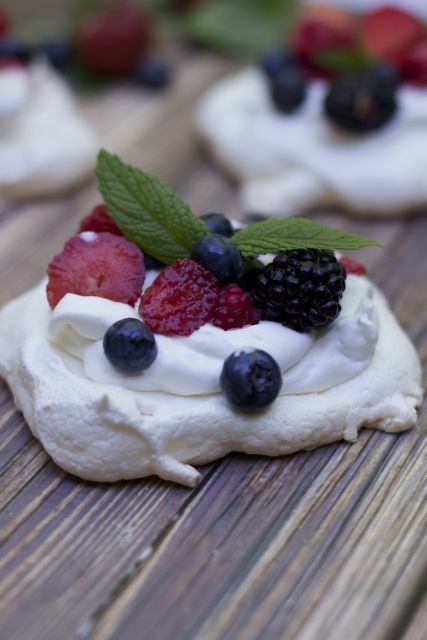 How would you top these pavlovas? yes it would, I just would not want to do it by hand!! 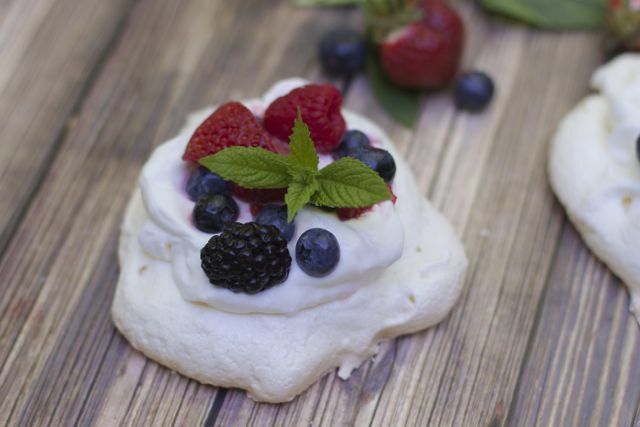 I have never made pavlovas but you make it seem super easy! I will have to try this soon! I don’t know why but I never made pavlovas before… Every time when I read a pavlova recipe I ask my self the same question… Delicious! Such a light summer dessert. I really like the color contrast with the fruit.